Molecularly imprinted monoliths integrate the high permeability of monolithic materials and the high selectivity and affinity of molecularly imprinted polymers (MIP). Thus, in recent years, development of this novel MIP format in HPLC has expanded quickly, particularly use of organic materials. This review focuses on the principal aspects of good practice in polymerization, theoretical studies, and recent developments in molecularly imprinted monoliths. Some thoughts on perspectives of MIP monoliths are also expressed. 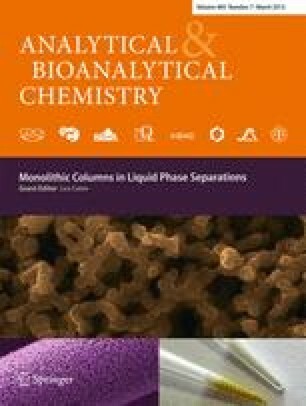 Published in the topical collection Monolithic Columns in Liquid Phase Separations with guest editor Luis A. Colon. This work was supported by the National Natural Science Foundation of China (grant no. 21075090) and the Hundreds Talents Program of the Chinese Academy of Sciences.